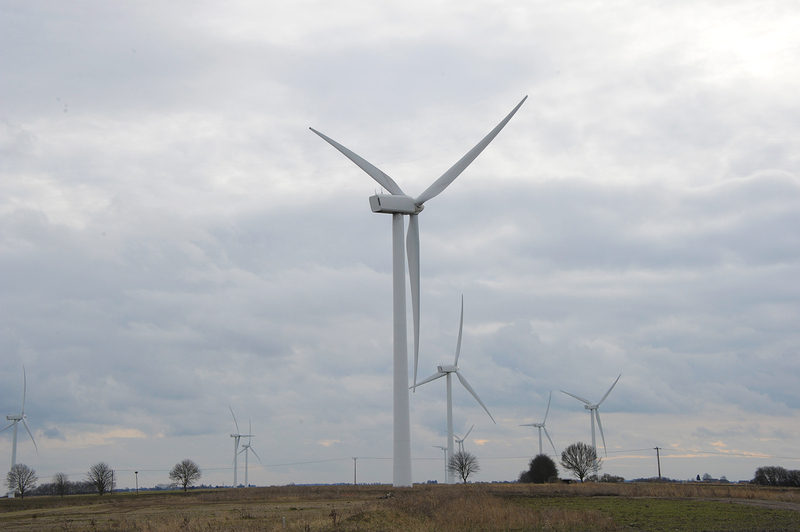 We were commissioned to carry out Site Investigation works for the design and construction of foundations, access roads and crane hard-standings for seven ‘Two Megawatt’ wind turbines, at Coldham in Cambridgeshire. Initially the investigation comprised a series of CPTu (piezocone) tests to 18m depth in three locations beneath each turbine location. Detailed analysis of this data enabled us to maximise the benefit of further intrusive exploratory works, targeting specific soil horizons. Cable percussive boreholes, in conjunction with high quality thin walled piston sampling and in-situ vane shear strength testing, were undertaken through marine alluvial layers, while routine standard penetration testing and undisturbed sampling was undertaken in the underlying competent granular and cohesive strata. Subsequent laboratory testing was undertaken on the high quality samples to provide soil parameters for bearing capacity and settlement analysis of the near surface soils and of the deeper competent cohesive strata to confirm strength parameters for turbine foundation design. The investigation highlighted existence of a stiff surface crust with an underlying highly compressible layer of organic rich cohesive material. Based on a bearing capacity and settlement analysis, crane hard standings were designed to limit the stresses imposed on the soft compressible layer and keep short term settlements within tolerable limits. The design was validated by large diameter plate bearing tests (at various critical depths and locations) to confirm settlement predictions and refine the ground parameters assumed from the ground investigation.